When the seasons change, don’t forget to switch your blinds and drapes. With the changing of the seasons, we switch out our wardrobes, transition to new bed linens and even swap out our home decor. But there’s another often-overlooked seasonal change we can make in our homes to bring more comfort and seasonal style: window treatments. The warmer seasons of spring and summer generally bring on the heat and intense sun rays. Blinds and shades help block the sun’s rays to keep the heat outside and protect furniture from fading. Outdoor shades work best at keeping UV rays from entering your home while providing daytime privacy. In the warmer months, make sure you have light-filtering window treatments on south-facing windows and windows with direct sunlight, and keep them lowered or closed during the brightest hours—usually 10 am to 4 pm. For bathrooms or homes located in humid places, look for window coverings that are also moisture resistant. The colder months during fall and winter, give even more reasons to invest in window treatments. Shades, blinds and draperies can all help create an insulting barrier between your windows and your home to help keep it nice and toasty during the chillier seasons. Keep shades and blinds lowered or closed during windy days and through the colder night hours to maximize insulation. Summertime means open windows, sliding doors and outdoor living spaces. With all of this openness, window treatments are essential in providing privacy from passersby. Blinds can be adjusted to allow breezes through while minimizing visibility (be sure that blinds are not lowered past the open part of the window as to avoid damage). Shades and blinds can be customized for porch doors and even outdoor spaces. As the winter days grow shorter, active evenings in your home require lots of light. Outsiders looking in can get a plain view. That’s where window treatments make a major play for privacy. Keep window treatments lowered or closed earlier in the evenings in the winter months to protect your personal space from nosey neighbors. Lastly, window treatments add dimension to your home’s design, emphasizing your personal style while adding function wherever placed. As the seasons change, so too can the décor in your home. Swapping out draperies and valences seasonally will improve your home’s design while also keeping your home cool in the summer or warm in the winter. Here are a few of our favorite ways to use the most popular window treatments to complete your home’s design and improve its functionality. Cellular Shade: Easily one of the most popular shade options, cellular shades offer a tailored look with excellent insulation. Additionally, they help protect your home from damaging UV rays. Roman Shades: Beautiful and functional, Roman shades elevate a home’s design. Available in a variety of fabric choices, Roman shades add an upscale touch. 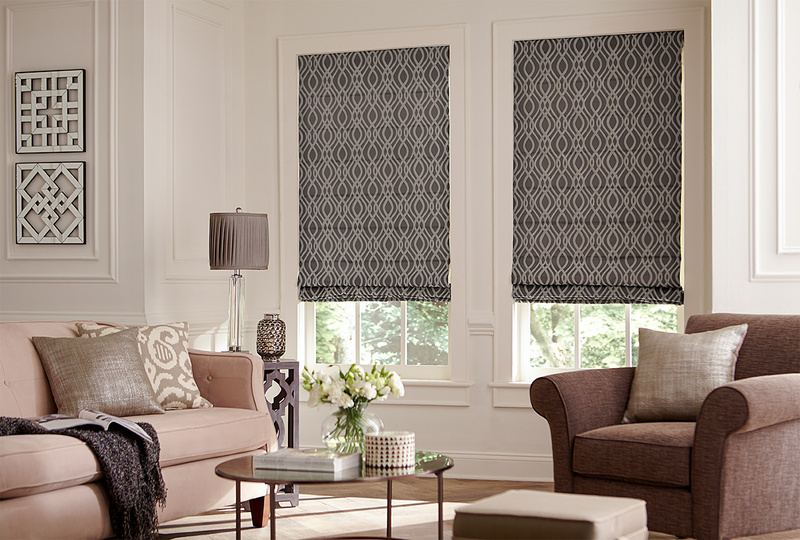 Roller Shades: Sleek and timeless, this window covering style pairs prettiness with privacy. Perfect for the bedroom or living room, roller shades are both functional and fashionable. Adding drapery panels to roller shades will add style and conceal the light gaps. Blinds: Blinds are cost-effective and efficient. Their ease of use and low-maintenance installation have made them a staple in many households. Ideal for homes in warmer weather, blinds offer privacy and the ability to control how much light is let in at any given time. Wood and Faux-wood Blinds: Wood’s rich, natural tone helps warm the room’s design while also keeping the temperature under control. Perfect for traditional or masculine styled spaces, this choice adds a subtle hint of depth and dimension. To lower costs, homeowners could also consider faux wood blinds that offer the same look and feel as real wood, and are water resistant and durable, too. Fabric Blinds: This classic style is most often found in home offices, libraries and studies because of their durable, dust-resistant nature. Simple and clean, fabric blinds are a trusted and inexpensive choice for homes that need lots of light without the maintenance. Vinyl Blinds: From grass cloth to smooth and glossy, this window treatment option offers plenty of variety. Vinyl blinds are perfect for rooms that require low-maintenance and durable finishes, like a playroom. Draperies: One of our favorite window treatments to work with, draperies allow for personalization and privacy in any room. Perfect for the changing seasons, draperies give homeowners a chance to express their personal style through fabric, color, pattern and hardware. For rooms that get more sun, drapes in heavier fabrics offer a blackout solution, while spaces that require a more styled look can be decorated with sinuous fabrics like linen and cotton drapery panels. Draperies are often layered with other window coverings. Paired with shades or blinds, draperies are a fashion-meets-function statement, and can be pulled back with decorative hardware for a truly show-stopping look, while covering any light gaps or imperfections that may exist in in your window. Thicker fabrics combined with blackout shades or heavier shade material are great for really warm spaces that may need to be shielded during the sunnier hours. Alternatively, light materials like linen drapery paired with roller shades give a fresh, springy look fit for homes in more temperate locations. For every season, make your window treatments work for you and bring your home the ultimate comfort and style. Katie Laird is the Director of Social Marketing for <a href="http://blinds.com">Blinds.com</a> and a passionate home decorator for her family with a love of all things Mid-Century Modern and blue.